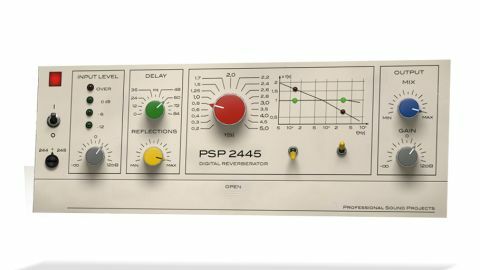 Despite its limitations, which feel both appropriate and slightly frustrating, PSP 2445 does a fantastic job of bringing two classic vintage reverbs back to life and relevance. Two rare classics in one plugin. Independent HF/LF decay modification. Combined 244+245 mode. Excellent short settings. Small choice of algorithms. Limited maximum decay time. PSP 2445 (VST/AU/RTAS/AAX) takes its inspiration from two classic EMT reverbs: the 244 and 245. While popular in their day, these units haven't made such a popular emulation choice with software developers, but given their close relationship to the reverb algorithm of the revered EMT 250, it's great to see PSP Audioware release them in one combined plugin. In fact, the developer has gone one better, as PSP 2445 also allows you to run one, the other or both in a combined configuration. In term of controls, the 244 and 245 were very similar, the latter simply gaining early reflections and pre-delay knobs. Here, PSP has made the early Reflections and pre-Delay available for all three configurations, although its stuck with the eight fixed pre-delay settings of the original (from 0-84ms). The original 16 reverb Times (0.4-4.5s) have become 19 settings, with the addition of the very short 0.2 and 0.3s, and the lengthy 5s. There's also an early Reflections amount control and two switches that controllow and high frequency reverb time/damping. Taking another step away from slavish emulation, a click of the bottom panel reveals some handy extra controls, including a high- pass filter, output Width, LR Balance, Low and High frequency reverb time adjustment, and switches (labelled I-II / II-I) to swap the left/right channel routing for each reverb. EMT's original units used 13-bit converters with a quoted frequency response of 30Hz-8kHz, and the PSP 2445 also kicks in a steep high cut at 8kHz. More importantly, though, PSP's version exudes the rich, almost plate-like depth that made the originals so popular. However, the difference between the 244 and 245 settings does come as a bit of a surprise: although the overall tonality is similar, the 244 is heavier in the mid-range, while the 245 is more 'scooped' with a brighter top end. What's more, the pre-delay is very clearly defined with the 244, whereas the 245 has a smoother transition. These differences contribute to the success of the combined mode, which simply blends the two algorithms to provide an additional reverb flavour. Given the extended decay range and additional High and Low frequency tail adjustment, you might assume the PSP 2445 would be ideal for big reverbs, but actually, for many uses, the large settings are a bit too coloured. Where it really excels is at medium and small sizes - it easily delivers that classic fat, wide, boxy 80s snare sound (0.4-1s), particularly when you wind up the early reflections. Alternatively, adding in some pre-delay (60ms upwards) creates a more slappy snare. For adding subtle ambient width to sounds, the new shorter settings (0.2 and 0.3s) are ideal; and the medium decays (1.5-2s) are great for synths and drum rooms. Finally, withthe combined setting, we got a nice effect swapping the late reflection output (setting II-I) for just one of the algorithms. There's lots to like with PSP 2445, and although it lacks a very long decay time and extensive parameter editing, PSP's respectful virtualisation does a very good job of capturing the essence of the original.